Donnadieu F, Freville P, Rivet S, Hervier C, Cacault P (2015) The Volcano Doppler radar data base of Etna (VOLDORAD 2B). Université Clermont Auvergne – CNRS. 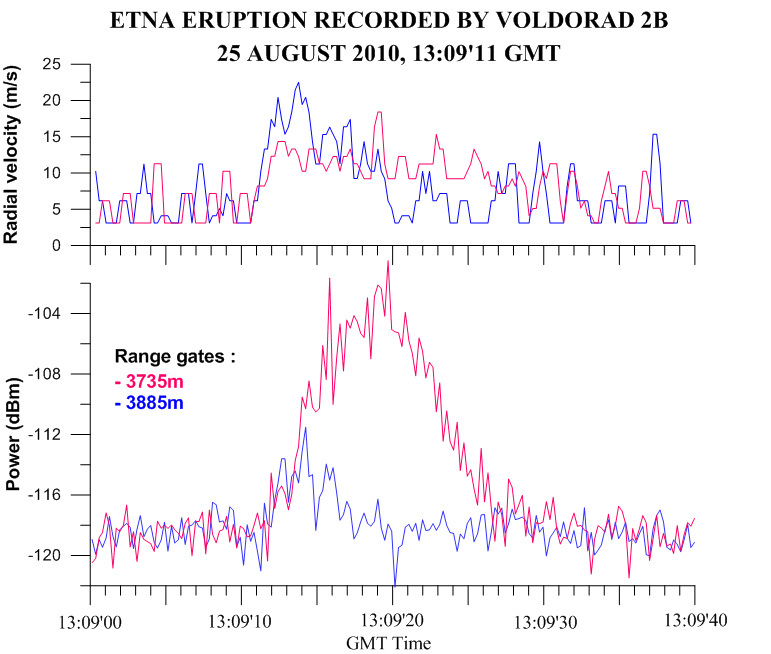 http://wwwobs.univ-bpclermont.fr/SO/televolc/voldorad/bddtr.php, doi: 10.18145/VOLDORAD.ETNA.2009. Donnadieu F, Freville P, Hervier C, Coltelli M, Scollo, Prestifilippo M, Valade S,Rivet S, Cacault P (2016) Near-source Doppler radar monitoring of tephra plumes at Etna. 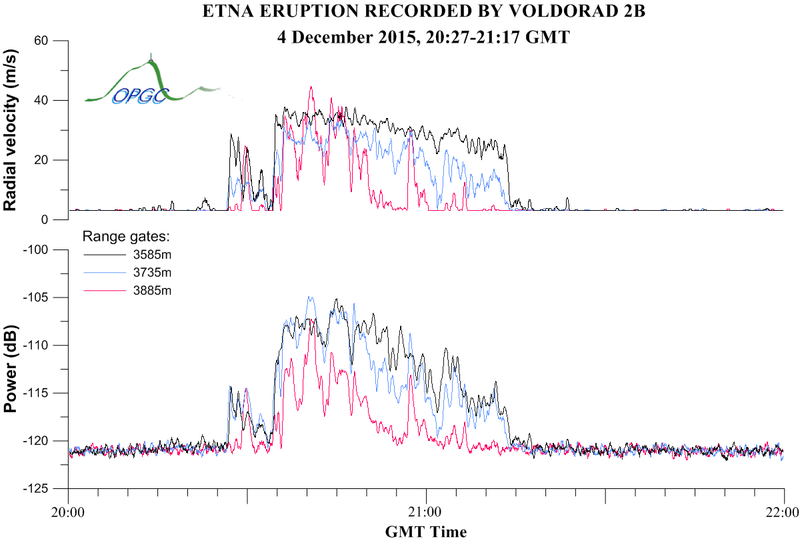 J Volcanol Geotherm Res, 312:26-39, DOI: 10.1016/j.jvolgeores.2016.01.009. 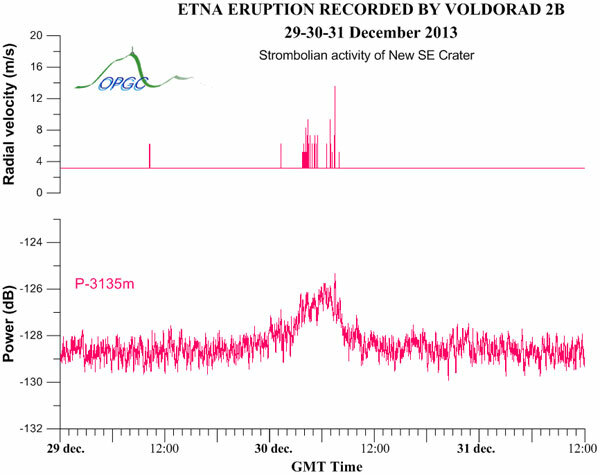 After an intensification of Stombolian activity inside the Voragine crater of Etna in the evening of 2 December, the Voragine produced a brief and violent eruptive episode in the night of 3 December 2015, the first since 1999, generating tall lava fountain over 1 km high and an ash and lapilli plume several km high (like in 1998 and 1999). The Doppler radar of OPGC (VOLDORAD 2B) at La Montagnola, operated in collaboration with INGV Catania, detected emissions of tephra in the 3585-3885 m range gates (slant distance of the central craters) from little before 02:00 GMT, with a first sharp increase around 02:07. After a short decrease 6 minutes later, a sharp increase in activity intensity occured again at 02:20 marking the onset of the paroxysm, which lasted quite steadily until 03:15. The paroxysmal phase was characterized by signal to noise power ratio of +18 dB and along-beam velocities of 50 m/s in average, with peaks above 60 m/s. 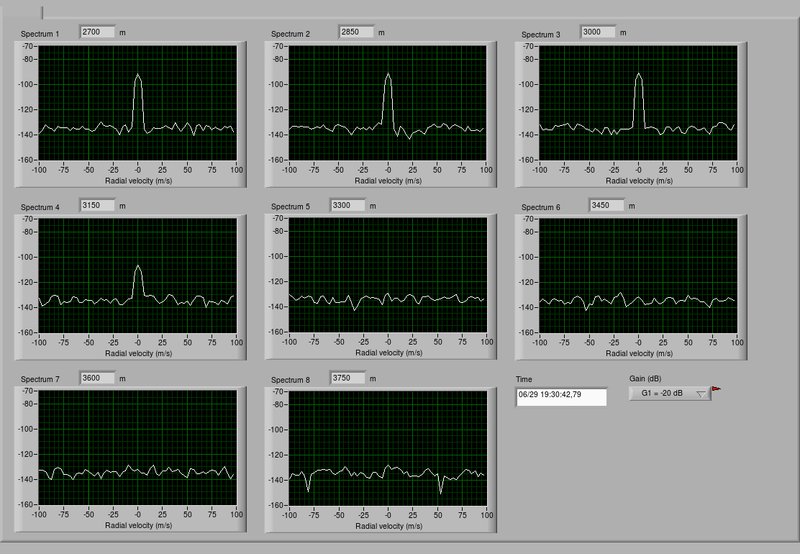 Measured velocities and backscattered power then decreased within 15 mn to background levels around 03:30. During the climax, tephra were detected from the 2985 m range gate to 4485 m (last gate recorded to the North), suggesting intense fallout of blocks and lapilli downwind, but also up to 1 km of the crater upwind. 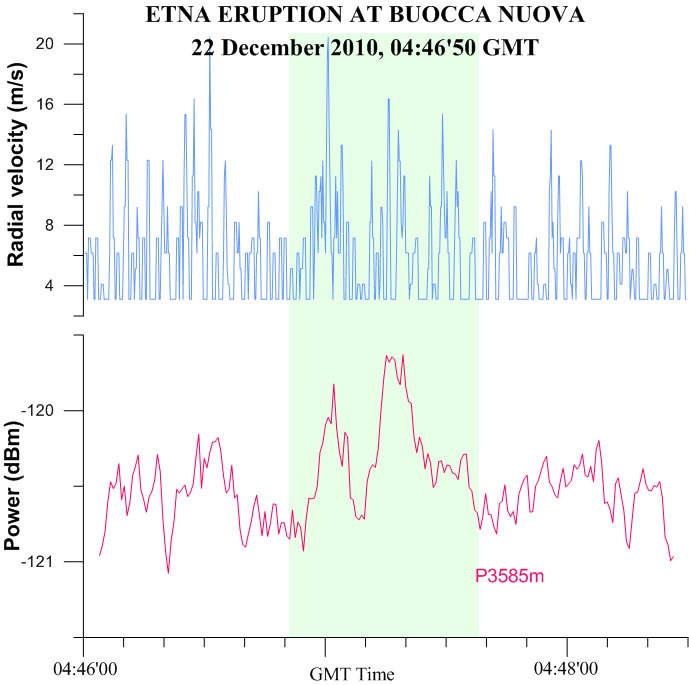 Winds were mainly toward the North East, generating ash fall in many towns like Linguaglossa, Francavilla di Sicilia, Milazzo, Messina e Reggio Calabria. 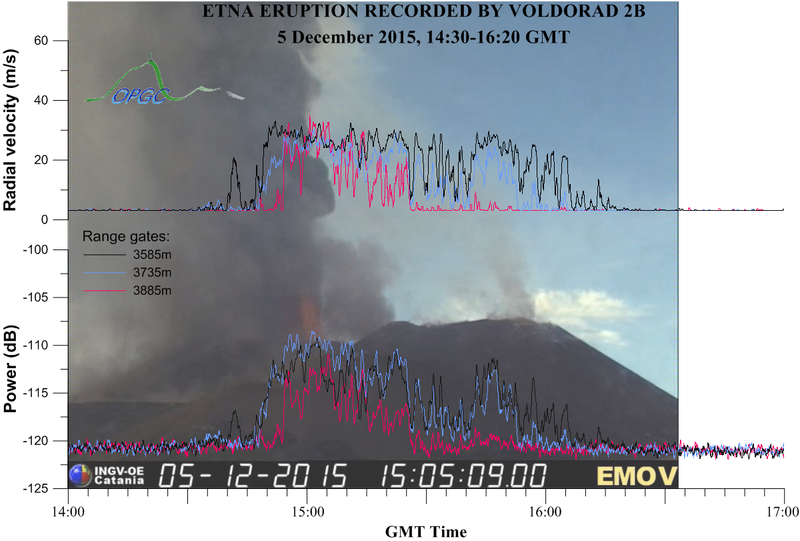 Celebrating the end of the year, Etna produced a new eruptive episode from its New South East Crater (NSEC) on December 28 2014, the first paroxystic event since December 2 2013. 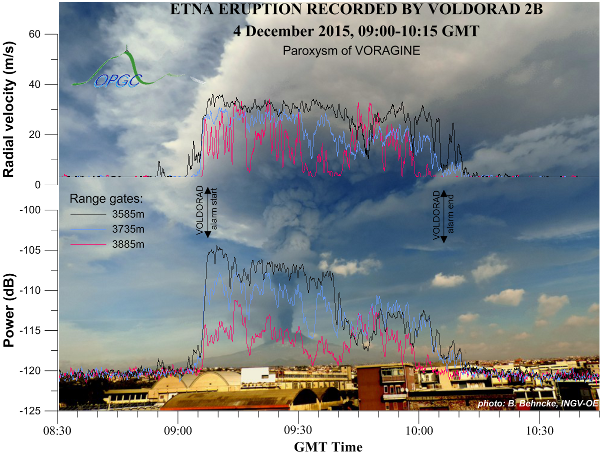 The Doppler radar of OPGC (VOLDORAD 2B) at La Montagnola, operated in collaboration with INGV Catania, detected emissions of tephra in the 3135 m range gate from 16:50 GMT, despite overcast weather preventing observations by cameras of the monitoring network. The activity then increased quickly as observed in the 2985 and 2835m range gates, associated with a strong increase of the volcanic tremor. 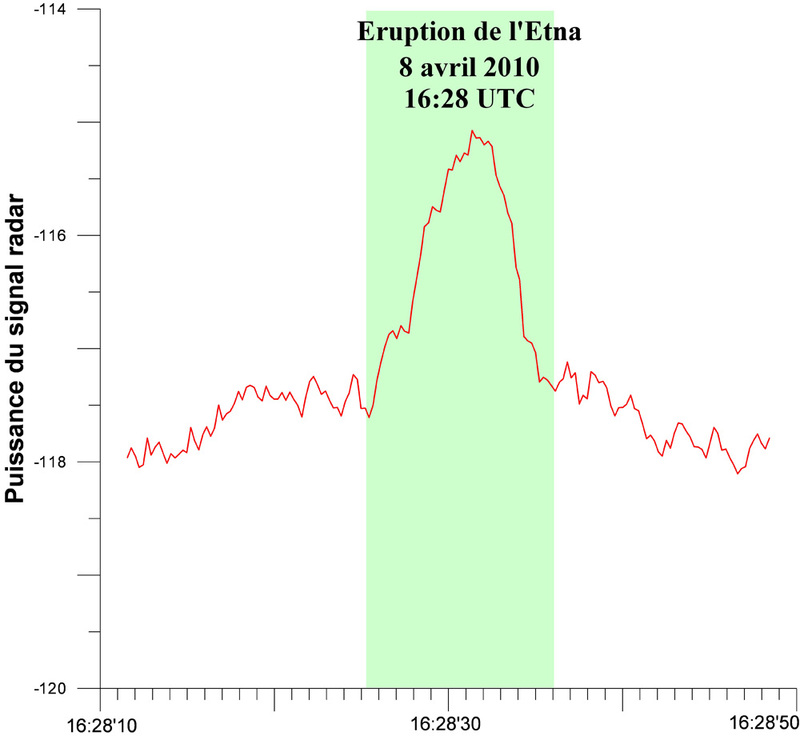 The power echoes remained high between 17:15 and 18:20 GMT and then decreased sharply in the 2985 and 2835m range gates. A more gentle decrease was observed at 3135m until around 19:30, with sporadic detection of tephra until around 20:00 GMT. Winds were mainly toward the East, generating ash fall in several villages. Etna produced a new eruptive episode from its New South East Crater (NSEC) between December 29 to 31 2013, the 8th since the start of the series on 26 October (46th since Jan. 2011) and 13 days after the previous paroxysm. This episode was similar in many respects to the previous episode on 14-16 December 2013, showing strong Strombolian activity not turning into sustained lava fountains, and producing modest amounts of ash along with lava flows. The Doppler radar of OPGC (VOLDORAD 2B) at La Montagnola, operated in collaboration with INGV Catania, started to continuously detect weak ash emissions in the 3135 m range gate (and 2985 m) between the evening on Dec. 29 and the night from 30 to 31. Winds were mainly toward South East, quickly pushing the small ash plume out of the beam. Measured ash plume internal velocities did not exceed 20 m/s. 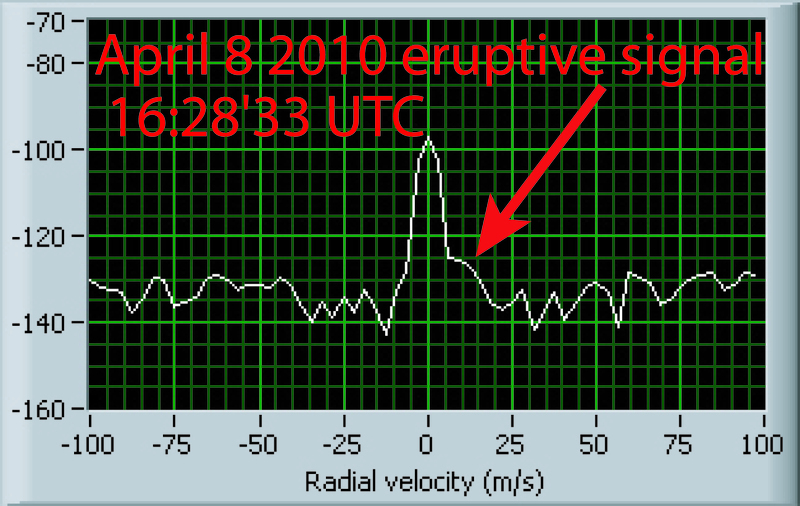 Radar signals from sporadic explosions were also recorded before and after the main activity (e.g. 29/12/2013 10:15 GMT with thermal image from INGV-OE webcam at Montagnola). Etna produced a new eruptive episode from its New South East Crater (NSEC) between December 14 to 16 2013, the seventh since the start of the series on 26 October and 12 days after the previous paroxysm (Dec. 2). 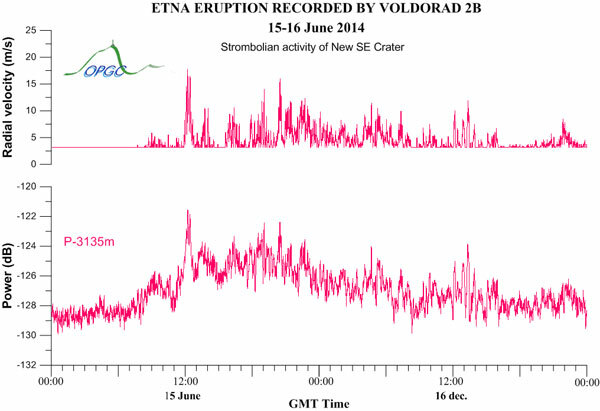 Although longer lasting than previous episodes the activity appeared lower in intensity, alternating from ash emissions to fluctuating Strombolian activity, and to short pulsated lava fountain. Lava flows were also emitted mainly toward Vale del Bove. The Doppler radar of OPGC (VOLDORAD 2B) at La Montagnola, operated in collaboration with INGV Catania, started to continuously detect ash emissions in the 3135 m range gate (due to wind toward South) from about 08:00 GMT on December 14. The activity then increased progressively following the tremor amplitude until about 04:20 on December 15 when signal dropped. Echoes stepped up again shortly after 09:15, then around 14:30, 18:00, and 23:30 on Dec. 15, then around 00:30 on Dec. 16, peaking at 01:30 before waning until 16:00, except for a short resumption after 06:00. 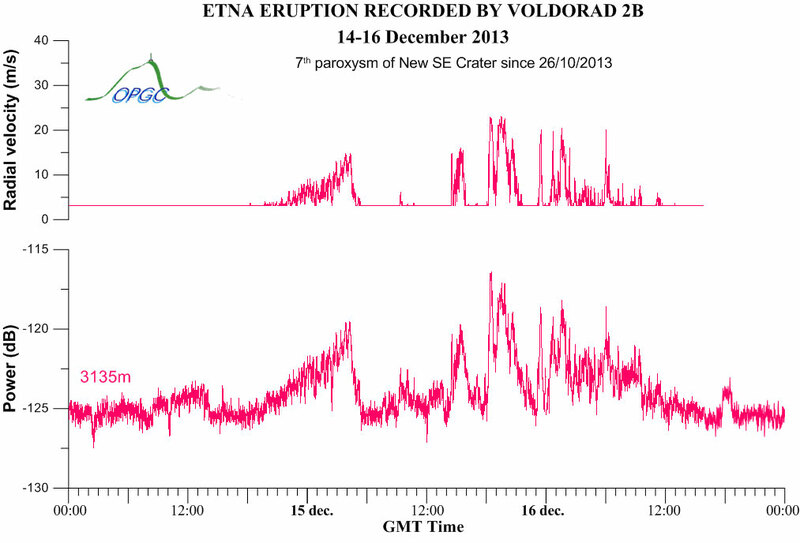 Measured ash plume internal velocities did not exceed 25 m/s. 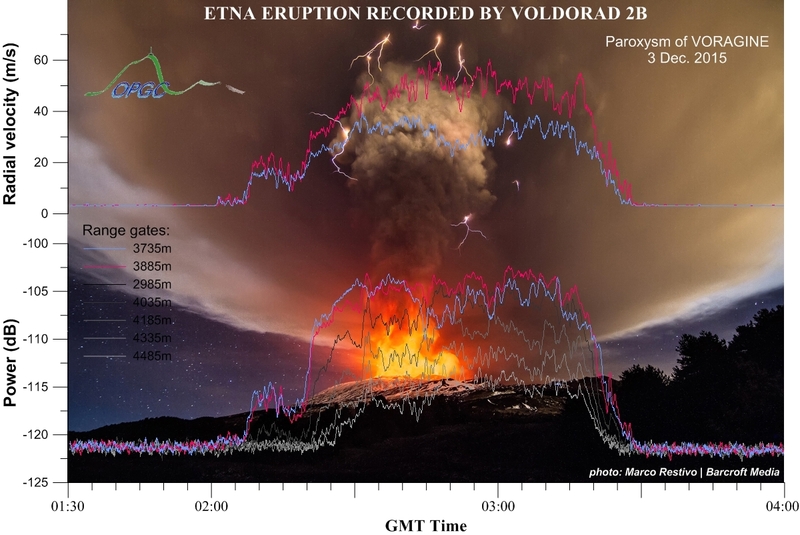 In the evening of December 2 2013, a new lava fountain paroxysm occurred at Etna's New South East Crater (NSEC), the 19th this year (the 44th of the series of paroxystic episodes initiated in January 2011, and the 6th of the new series started on October 26 2013), just 4 days after the previous paroxysm. 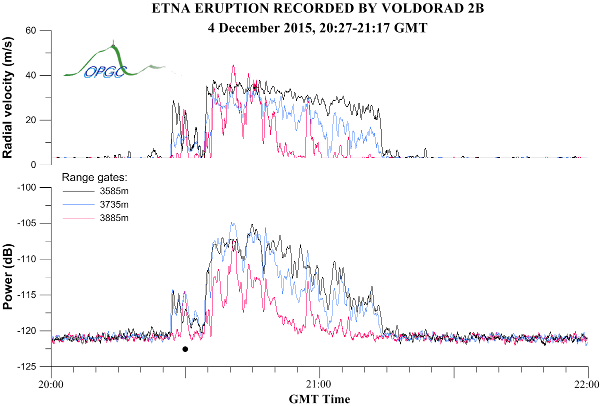 The Doppler radar of OPGC (VOLDORAD 2B) at La Montagnola, operated in collaboration with INGV Catania, started to continuously detect ash and lapilli from about 19:18 GMT. The activity then increased progressively, except for a short drop in radar signals around 20:10, and more strongly at 20:35, until the paroxysm (21:00 - 22:00 GMT). In this time interval, echoes from the fountain-fed plume were recorded in all range gates (11) despite the fact that wind was blowing toward WNW. 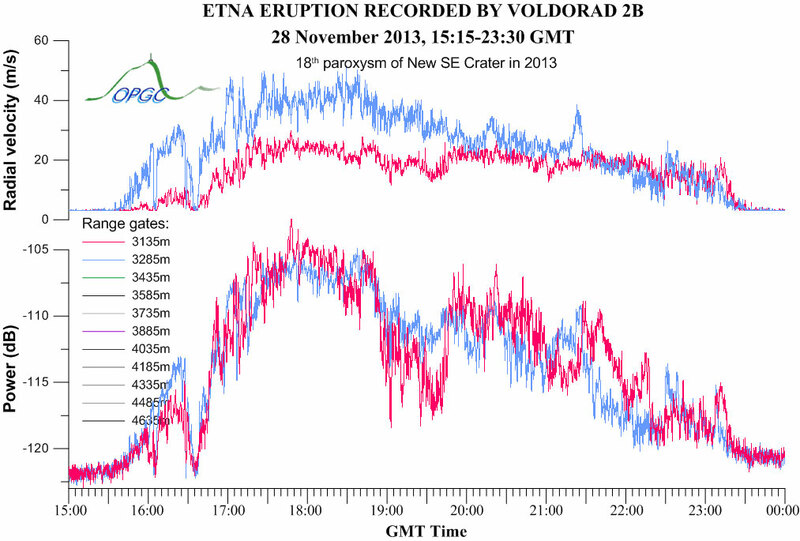 Measured velocities were in the range 35-40 m/s, with peaks up to 50 m/s. 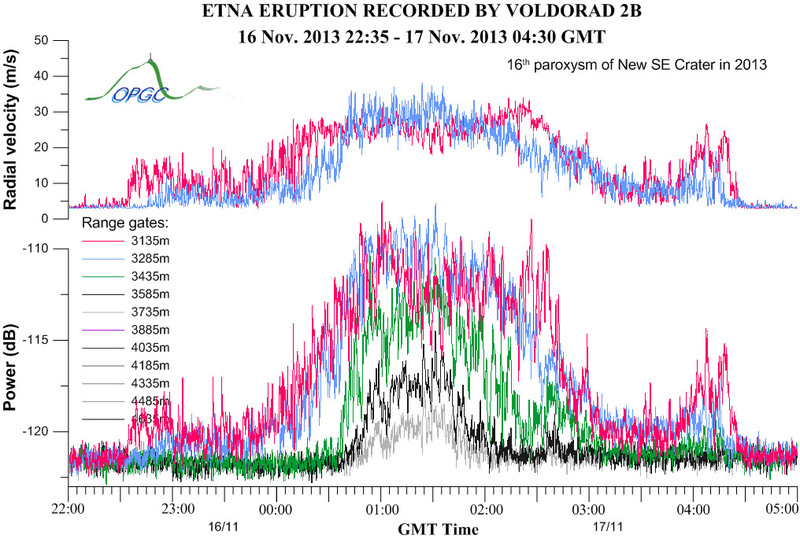 Power echoes and velocities started to wane from 22:02 GMT, and then more rapidly between 22:06 and 22:25. Radar signals were back to background level around 22:45 GMT. In the late afternoon of November 28 2013, a new lava fountain paroxysm occurred at Etna's New South East Crater (NSEC), the 18th this year, 5 days after the previous paroxysm. The Doppler radar of OPGC (VOLDORAD 2B) at La Montagnola, operated in collaboration with INGV Catania, started to detect ash and lapilli from the fountain-fed plume from about 15:15 GMT. The activity then increased until the paroxysm (17:20 - 18:50 GMT), except for 15 mn of less intense radar signals (16:25 - 16:40 GMT). Echoes were recorded in up to 7 range gates as wind was blowing toward NE, and measured velocities peaked at 50 m/s. 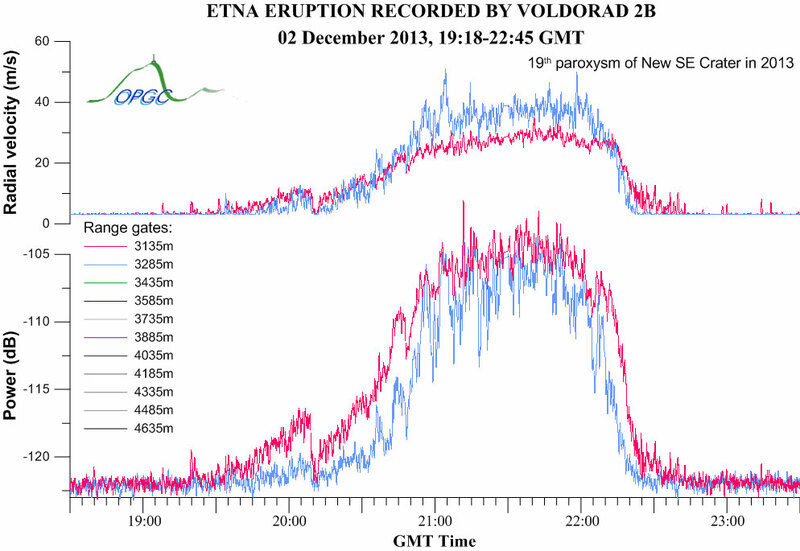 From 18:50 GMT, power echoes and velocities gently decreased until about 23:30. In the morning of November 23 2013, a new lava fountain paroxysm occurred at Etna's New South East Crater (NSEC), 6 days after the previous paroxysm. The Doppler radar of OPGC (VOLDORAD 2B) at La Montagnola, operated in collaboration with INGV Catania, started to detect explosive activity from 07:00 GMT on. 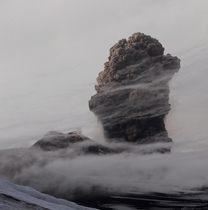 The activity gradually increased until about 09:30 when echoes from the fountain-fed ash and lapilli plume increased more strongly. High amplitude backscattered power was measured in up to 11 range gates (3135 - 4635 m) during the most intense phase (09:45 - 10:15 GMT). Radial velocities around 60 m/s were measured inside the convecting plume heading to the NE, and peaked at 75 m/s around 10:04 GMT. 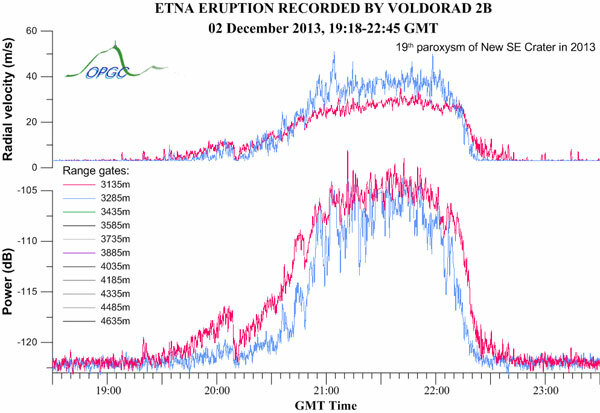 At 10:15 GMT, echoes and eruptive velocities dropped quickly until 10:26. Weak activity was recorded by the radar until about 10:40 GMT. In the night of November 16 to 17 2013, a new lava fountain paroxysm occurred at Etna's New South East Crater (NSEC), 6 days after the previous paroxysm. It was detected by the Doppler radar of OPGC (VOLDORAD 2B) at La Montagnola, operated in collaboration with INGV Catania. Radar echoes from the ash and lapilli plume were mainly recorded in 6 range gates (3135 - 3885 m). Radial velocities generally below 40 m/s were measured inside the convecting plume heading to the NE. 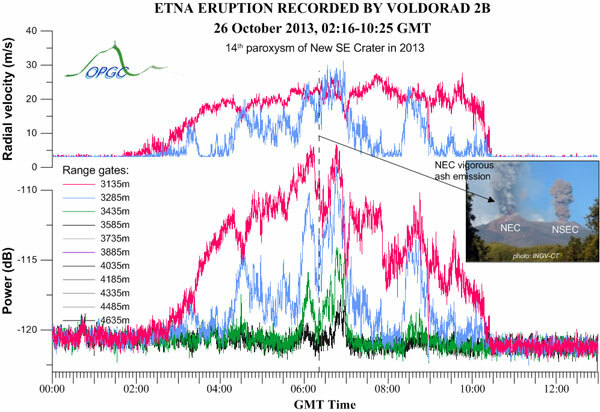 In the morning of November 11 2013, a new lava fountain paroxysm occurred at Etna's New South East Crater (NSEC), 16 days after the previous paroxysm. 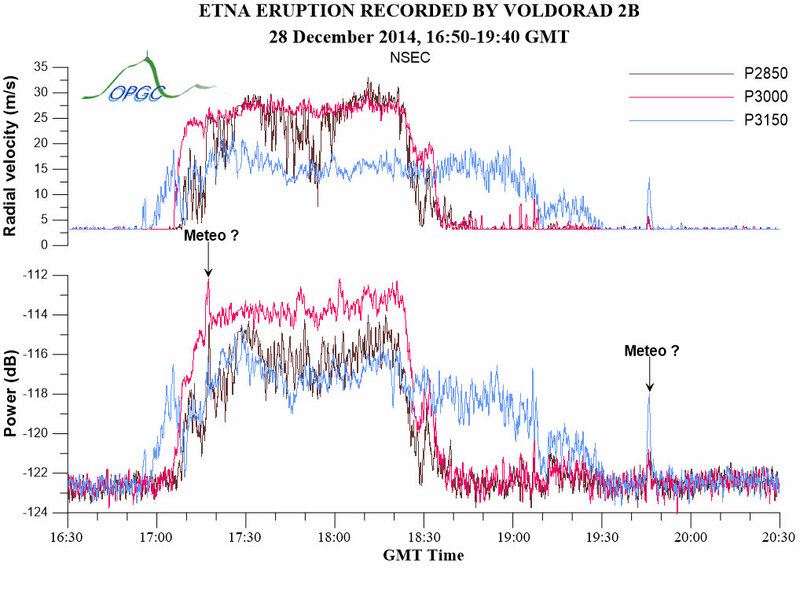 The Doppler radar of OPGC (VOLDORAD 2B) at La Montagnola, operated in collaboration with INGV Catania, started to detect episodic explosive activity the day before and then continuously from 01:45 GMT on November 11. 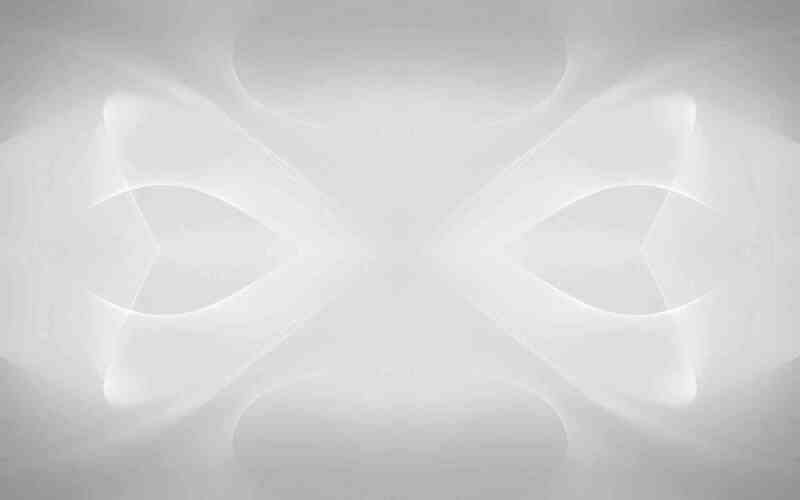 The power and velocity signals increased progressively until about 08:00, stepping up around 03:00 and again around 06:00, although both parameters did not reach the values of the previous paroxysm. Measured velocities were in the range 15-25 m/s. 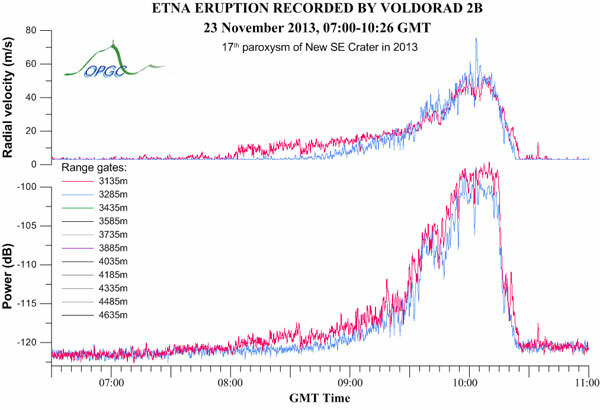 Shortly after 08:00, echoes from the fountain-fed ash and lapilli plume dropped at 3135 m whereas they were strengthened at 3285m and echoes appeared farther up to 4585 m. Radial velocities averaged 30-35 m/s at 3285m between 08:50 and 09:50, occasionally peaking at 50 m/s. 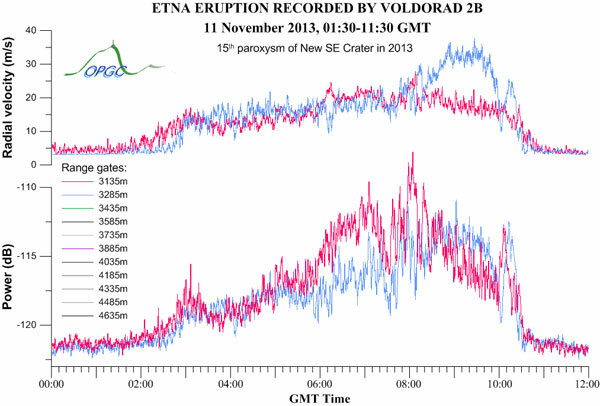 From 09:50 GMT, echoes and eruptive velocities dropped until around 11:00, except for a short resumption after 10:00. 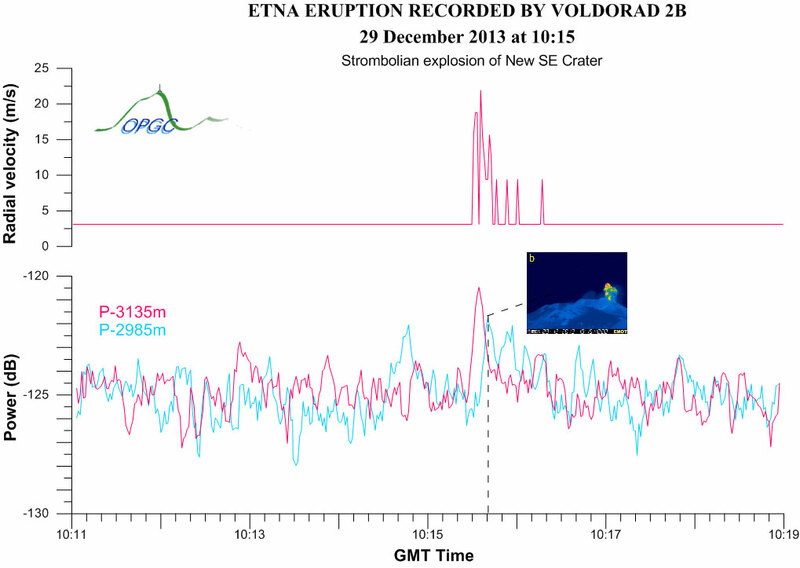 In the morning of October 26 2013, a new lava fountain paroxysm of Etna's New South East Crater (NSEC) was detected by the Doppler radar of OPGC (VOLDORAD 2B) at La Montagnola, operated in collaboration with INGV Catania. This was the first episode in 6 months since the last lava fountain on April 27. Radar echoes from the ash and lapilli plume were mainly recorded in 4 range gates (3135 - 3585 m). Radial velocities generally under 30 m/s reflect the particle ascent speed of the convecting plume advected to the SW by the wind.